Scam websites are not new, but they are rampant, just like Nancies reviews. To the left is a pic of nancyreviews com. The video below describes how this website operates. I am not sure if nancy is a real person or not, but I doubt it. It really does no good to try to research these people, but I did a little research on the nancy reviews site. I found nothing but generic information about this alleged real person. Nancies reviews are supposed to be giving honest un-biased reviews about products online. I doubt this person knows much of anything about these products they are promoting. She or they, claim to have bought and used these products. Most likely they are just embellishing on the provided information by the creator. 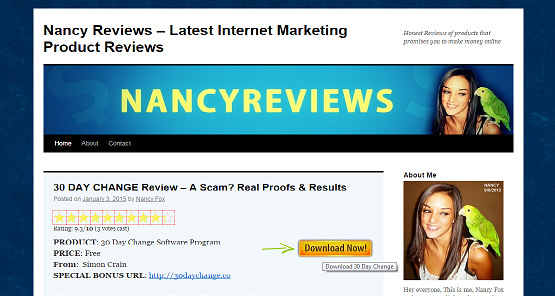 Nancies reviews always makes front page of Google whenever a new product launches, so I would be comfortable in saying that this site is connected to the “Gurus” selling this crap. When it comes to buying things for my online business, I want to be sure I have a product that is going to do the job. The last thing I want to do is get scammed on products and services for my online business. We depend on honest reviews to make wise decisions. The person operating this site does not care. They are taking affiliate offers, writing short positive reviews, and waiting for the money to roll in. I cannot say all that she promotes are scams, but I have seen quite a few. The binary option robots are the worst. I start these videos talking about binary option scams. One of the most common are news websites (to the right) These are not new and have been around for a while. I explain these in the videos below, and how you know it is a scam site. These are websites made to look like real news websites, but have no news value or content other than the sales page for the scam. If you click the links they take you nowhere, and the share widget is not even real. I have seen a few of these sites floating around. 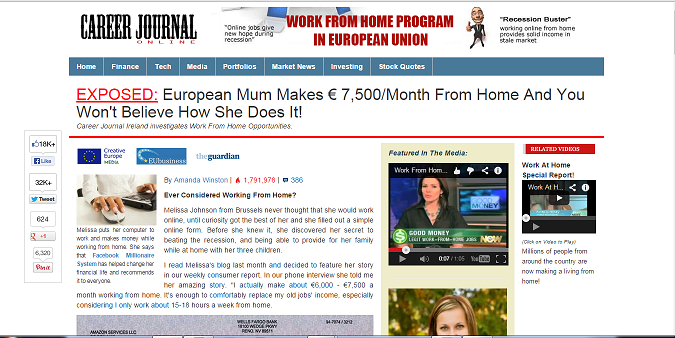 Here is an important tip, if you suspect a scam website, click the links and see were they go. Don’t be afraid to do a little checking and research. It is your money they are trying to steal, don’t be a victim. The video below started out to be about a binary option software scam called fast wealth club, but I quickly go into a rant about nancyreviews com. PreviousFacebook Millionaire System Scam/Is Facebook Hiring?